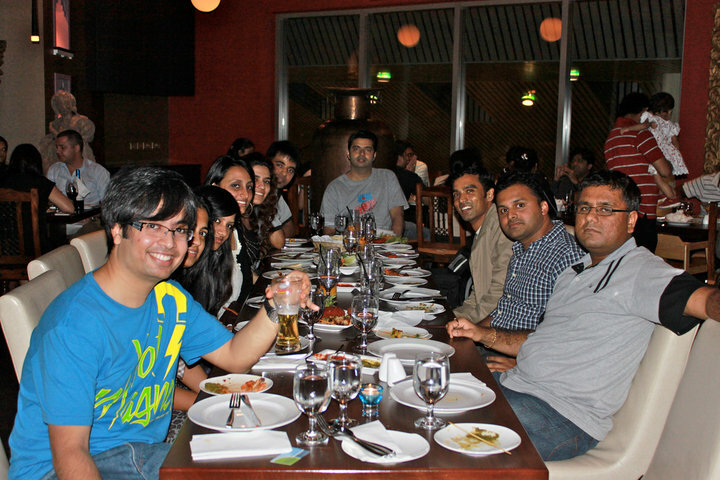 The first Indiblogger meet outside India took place in Singapore (Indising) and I am proud to say that I took part in it. It was entirely different from the usual blog-meets where the ice breaking session would consume 50 % of the time. 11 participants took part in the Indising meet and it took no time for the 11 of us to break the formal shackles. We sat around a table and started yapping like college students catching up after ages. We even started pulling each other's legs at the end of the two hour meet. Now It is my duty to introduce to all my readers, the ten bloggers I met through this meet. If you carefully follow the story board below, you would surely be remembering all the names of the 10 bloggers. You can click each picture to get a better view. Jamshed's first time in the last bench. If you had followed the story so far, all the 11 characters would be in your finger tips. If not, read again. Ha Ha.. nice one.. and yeah thanks for making me the first bencher for a change! have always been a LLB (Lord of Last Bench) during most of my schooling! haha...my class flaunts of a "Back-Benchers' Association" (BBA). This post reminded me of it. P.S. :You are blogrolled as "Laughter Dose". Aww!!! Thanks for making me the beauty :$, now I just want to know if those 3 crushes were real or not :) hehe! thala epo inga bloggers meet? ha ha, great, i also need to attend one of these meets someday. And how was your fever? Good to know, Chriz. :) Was just wondering why the longish delay between your last post and this! I'd like to be Miss.Maria's student. Please give the blog link. Hey Chris - So u made a trip all the way up for this ! How so romantic !! By the ways, will you do something for me ? Will you overlook my lazy self not being here for a long time and buy my book which just got out on print - Link on my blog. For old time's sakes, bussy. Love ya ! @Surya : Miss Maria quit taking classes these days..
@Anwin : yes.. we had fun.. looking forward for more meets..
i was the back bench co-leader :P..well it sure reminds the college days :)..